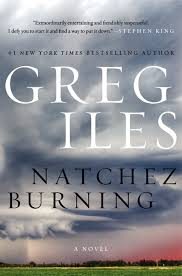 Natchez Burning by Greg Isles is a 2014 William Morrow publication. I was provided a copy of this book by the publisher and Edelweiss in exchange for an honest review. Since we last caught up with Penn Cage, his father has survived a heart attack and Penn is now the mayor of Natchez and preparing to marry his long time girlfriend Caitlyn. Before the wedding can take place all hell breaks loose, literally. A former nurse for Tom Cage has died of terminal cancer. Her son, Lincoln, believes Dr. Cage performed an assisted suicide and is livid. He has the D.A., a long time enemy of Penn's, believing Dr. Cage committed murder and now Tom is facing prison. Penn will go to any length to prevent this from happening. As a result Penn will learn many things about the father he idolized his whole life and will uncover some of the most horrendous race crimes committed in Natchez in the mid to late 1960's. Viola was Tom's nurse during the sixties and she was a beautiful African American woman with whom Tom may have had more than a professional relationship with. While this relationship is at the heart of many personal issues relating to Viola's death, it is also the gateway that leads Penn to investigate the murder of Viola's brother back in the 1960's, right before Viola left for Chicago. Race crimes in this period of time were certainly not unheard of and were played across the nation giving Mississippi a reputation it lives with even now. But, those were just the ones that made it into the spotlight. Some of these old cases were never solved. Viola's brother, and a young man that may have been having an affair with a white girl whose father was one of the wealthiest and most powerful men in the state, are a few examples. Naturally, the girl's father would go to great lengths to break that up, maybe even murder. In fact, he may have been involved in organizing a top secret group of men that went well beyond anything the KKK ever thought about doing. Now many of those men are approaching the end of their lives and some of them are riddled with guilt and remorse prompting others to take drastic measures to keep them from making death bed confessions. The fear that Viola might tell a few tales has Penn thinking someone, and not his father, murdered her. Penn must deal with his old nemesis, Shad, the D.A., a rogue sheriff, his ambitious fiancé , his mother's protective instinct, the shock of his father's past, Tom's refusal to talk about certain things and the knowledge that his father is lying to him. The deeper he digs and the more he unearths of the past the more danger he and his father are in because someone will do anything to keep the past and all it's sins buried. This type of book is the reason I refuse to hand out five star ratings nilly willy. When a book this good comes along it deserves that honor and only books that really stand out like this one should be given a top rating. Wow! Just Wow!!! The long five year wait for this book felt more like ten years. The last book in the series left us with a bit of a cliff hanger and so fans have been eagerly anticipating resolution. The author used some real life unsolved crimes as a basis for the story. I could almost feel the sticky Mississippi humidity, hear the soft southern drawl, and see the charming town of Natchez and I could absolutely picture the extreme tension of the 1960's when race relations were at the center of everyone's thoughts and terrible, terrible, crimes were committed by closed minded, power hungry, hate filled people. The very idea that a black person and a white person could be in love would most assuredly lead to someone's death. To have that type of a relationship was the riskiest thing you do. That didn't stop some from going ahead and acting on those feelings. Some would have more to lose than others and some would pay the ultimate price. These forbidden relationships at the center of all the crimes examined in this novel. While not everything was wrapped up in a neat little bow, there are more installments coming in this series and thankfully there was no big cliffhanger. I personally have held my breath hoping against hope that Penn will realize he deserves better than the overly ambitions," my career trumps family", Caitlyn. But, we won't get any pat answers here on that front, but I do have a sinking feeling he haven't seen the back of her yet. As to certain other issues regarding Tom's past and what could have been, we are left to draw our own conclusions. For sure you will not think of the great Tom Cage in the same way again. He is human after all and of course so is the great Penn Cage. How all this will play out in the future will certainly be interesting. I can't wait!!! On a personal note- Greg, it is so good to have you back. I have really missed you!